Arizona Landlord Tenant Blog: Must an out-of-state owner/landlord have a local property manager? 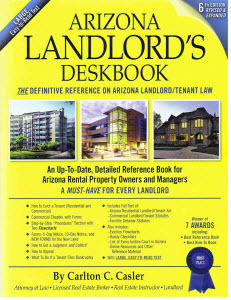 FREE information about Arizona landlord and tenant law (both commercial and residential landlord and tenant law), step-by-step instructions regarding various Arizona landlord/tenant procedures and also offering products and services available for purchase that make owning and renting Arizona real property easier and much more profitable. Exclusively about Arizona landlord and tenant law (commercial and residential). How should a landlord "document" property damage caused by a tenant? Can a judge lower the amount of rent, late fees, and/or attorney's fees? What are a landlord’s obligations to a tenant regarding the move-out inspection? How can a residential landlord recover possession of a rental unit? Can you charge a late fee without a written rental agreement? What is "normal wear and tear"? What if a residential tenant is renting a house that is the subject of a short sale? Can a tenant get out of a lease before the end of the lease if the tenant must (or elects) to move out of Arizona? Must an out-of-state owner/landlord have a local property manager? Can a commercial landlord include provisions in the lease that take away most/all of the tenant's rights away? No, out-of-state owners/landlords are not required to have a local property manager, but out-of-state owners/landlords of residential rental property must have an in-state “statutory agent” (see A.R.S. Section 33-1902.B), which is different than a property manager. A property manager manages the property, collects rent, etc., whereas a statutory agent merely receives notices and legal service of process on behalf of the owner. If an out-of-state residential landlord fails to have a statutory agent, the landlord is subject to substantial statutory fines (i.e., $1,000 plus $100 per month) and this is also legal grounds for a tenant to terminate an existing lease. So, as a practical matter, although an out-of-state residential landlord IS NOT required to have a property manager, it makes sense to have an Arizona property manager because s/he can be more responsive to complaints, etc. Also, if there is an eviction, the Arizona property manager can provide testimony about the relevant facts, otherwise the out-of-state owner will need to personally appear to give testimony. If you are an out-of-state residential landlord and need an Arizona statutory agent, go here: www.ArizonaStatutoryAgentServices.com. Download the "Act" in .PDF format here.